It may be helpful to refresh your knowledge of the periodontal probe, by reviewing the last blog. Typically, when we probe around each tooth with the periodontal probe, we want to get numbers like one, two or three mm…these numbers indicate health. However when the number is higher than three mm, then this means that there is a problem. If the probing depth is greater than 3mm, then we hope that it is because the gums are swollen (edematous). The reason being that the problem of swollen gums can be reversed quite easily by stepping up with your brushing and flossing…particularly the flossing (see blog on proper oral hygiene techniques). If your gums bleed while flossing, just keep flossing and massaging them, even if they hurt. By continuing to work on your gums they will eventually tighten up and stop bleeding and the pocket measurements will reduce. If the probing measurements (greater than 3 mm) are due to actual bone loss and not swollen gums, then we will be able to see the bone loss on x rays. In addition to this, the tooth may be loose. If there is less bone holding onto the root of the tooth, then the tooth will be loose. There are different ways to treat the pockets that are greater than 3mm. The type of treatment depends on the severity of the pocketing measurement. 1) Probing measurements that are 3 mm or less are considered to be healthy. We advise the patient to keep up their home care and come in for regular cleanings (usually every 6 months). 2) For measurements that are 4-5 mm, we generally place the patient on a 3-4 month ‘recall’ cleaning frequency, and combine it with good home care. By having the patient in for more frequent cleanings than 6 months, we are able to get into the deeper areas and clean them out with our specialized instruments. This will prevent them from getting deeper. 3) For pocketing measurements that are 6 mm or greater, the treatment usually involves some type of ‘gum procedure’ in order to reduce the deeper numbers. The goal of treatment is to lower the pocketing measurements to numbers that the patient can deal with and keep clean on their own. Patients are able to keep pockets of 3 – 5mm clean on their own and also by coming to our office for 3 month cleanings. 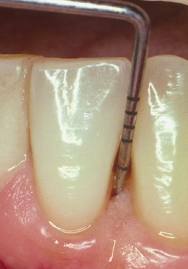 However, pockets of 6mm or more often need a little more help via a gum procedure. A topic that I’ll expand upon in the next blog. One of Brampton’s most recommended dentists, Dr. Robert Axelrad has owned and managed his own dental practice in Brampton since 1997. Affectionately known by his patients as “The Gentle Dentist”, he moved his practice to its current, state-of-the-art dental office in 2002 to accommodate his growing list of happy patients.